Elm Creek siding was established in August 1866 during construction of the Union Pacific Railroad. The nearby creek provided both water and timber for the railroad's locomotives. By 1872 a school-church building, a saloon-restaurant, a store, and a post office formed the nucleus of a town. The railroad brought settlers to the area, many of whom were Irish emigrants and railroad workers. They acquired homesteads and timber claims from the government or purchased land from the railroad. About 1880 the Union Pacific constructed a depot one mile to the east of the original town and the village soon followed in 1883. 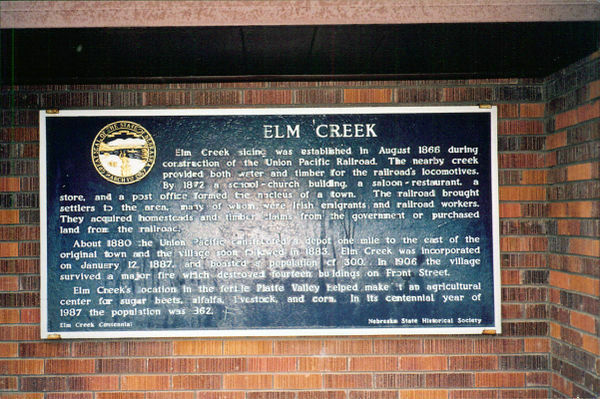 Elm Creek was incorporated on January 12, 1887, and boasted a population of 300. In 1906 the village survived a major fire which destroyed fourteen buildings on Front Street. Elm Creek's location in the fertile Platte Valley helped make it an agricultural center for sugar beets, alfalfa, livestock, and corn. In its centennial year of 1987 the population was 862. “Elm Creek,” Explore Nebraska History, accessed April 18, 2019, https://mynehistory.com/items/show/29.